The Wrong Kind of Clouds is launched! That makes it sound like a ship... I suppose there was champagne invoved but none of it got smashed against the books, thankfully! The launch was at Waterstones in St Andrews, who have been absolutely brilliant to me, from first approach to them onwards. I seriously can't praise them enough. I've given thousands of lectures and never been as nervous as I was at the launch. Thankfully, everyone was absolutely fabulous and supportive. After some meet and greet, I was nobbled to start signing. I think that was the most stressful part to be honest... trying to get everyone's name right; write legibly; remember to sign the book! 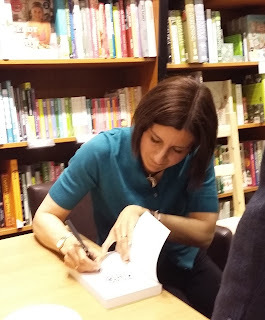 When there was finally a gap in the queue for me to sign, the staff managed to get me over to the open area in the store, ready to do a reading and a question and answer session. I was shaking for the reading. I never shook in lectures. Well, not in the last decade or more. But I got through it (croaky voice from hay-fever-induced-asthma notwithstanding!). I read the opening scene, and then there was the Q and A session. It seems that everyone wants me to write a sequel! I've written 3/4 of a sequel... better get on with that as my next task, huh? Once the question and answer session had finished there was another flurry of signing before my Rotary Club (Howe of Fife) whisked me away for a celebratory dinner. All in all it was an absolutely fantastic night! The paperback is available from good online booksellers. You can also get the Kindle version via the links below. For other e-book formats, go here (publisher's site) and follow the links on the right-hand side. You can order the paperback from there too.